What is Facebook? Facebook is a social networking community (commonly referred to as Social Media) that was founded in 2004, where users interact with their family, friends, acquaintances, and even meet new friends! Facebook is the largest social network worldwide with more than 500 million active users (over 30% are in the US alone) and which more than 50% participate on a daily basis. Over 40% of all Facebook users connect via their mobile device (such as a smart phone or tablet.) The average Facebook user spends approximately 1 to 3 hours daily on the site, and has between 100 and 200 friends. In addition to interacting with others, users can also interact with brands, organizations and businesses. The average user connects with 80 community-oriented Fan Pages. This is where the Grange comes into the picture. Over 25 of the Community Granges, as well as one half of the Pomona Granges in Connecticut, now have official Facebook Fan Pages. What are some of the benefits to your Grange by having a presence on Facebook? Reach: One of the top benefits of having a Facebook Page for your Grange is the ability to reach your members, supporters, the media, and the community. These people are referred to as “Fans” of your Grange. Your Grange Page updates (comments, announcements, photos, links, videos, etc.) will appear in your fans’ news feeds once they “Like” your Grange’s page. This is a powerful way to increase awareness of your Grange and its projects and activities. Building Community: Facebook is an opportunity to engage with others on a less formal level. Granges that utilize Facebook to its fullest extent receive the greatest payback. Granges that let their Pages sit idle will find that they are quickly forgotten about or overlooked. Facebook pages are the perfect place to gather together your supporters and members through posting useful information, relevant and interesting links, and more. If you engage your fans, they will contribute through “Likes” to your posts, comments, reviews, feedback and more. Fans will also share your information with others (who may not be Grange members!) thus generating interest. Facebook pages successfully bring people together, and thus develop a loyal community that continues to grow. Insights: One of greatest tools available to Granges having Facebook pages are the analytics (called Insights) that are generated once your Page has more than 30 Fans. These stats and figures tell who is looking at your Grange Page (age, male/female, location, etc.) as well as showing what posts are generating the biggest buzz. This information allows Page administrators to gauge the level of interaction, and thus tailor future posts and updates to see greater benefits. If you are interested in starting a Facebook Page for your Grange - contact the Public Relations Committee today! 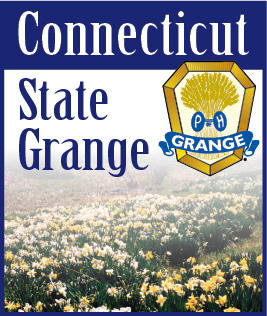 (information@ctstategrange.org or publicrelations@ctstategrange.org) We will set-up your Grange Page properly according to Facebook’s Terms of Service, index your Page with the Search Engines and link it to the CT State Grange Website to increase visibility - and then turn it over to your Grange to manage. Communications mediums are continually changing and evolving, and social media entities like Facebook are everywhere. Test the social media waters and give Facebook Pages a try for your Grange. And… the best benefit of all - potentially gaining new members!